3. GOVERNING LAW. These Terms shall be construed in accordance with and governed by the laws of the United States and the State of Colorado, without reference to their rules regarding conflicts of law. You hereby irrevocably consent to the exclusive jurisdiction of the state or federal courts in Castle Rock, Colorado in all disputes arising out of or related to the use of the site. 7. COMPLIANCE WITH INTELLECTUAL PROPERTY LAWS. When accessing the Site or using the Service, you agree to obey the law and to respect the intellectual property rights of others. Your use of the Service and the Site is at all times governed by and subject to laws regarding copyright ownership and use of intellectual property. You agree not to upload, download, display, perform, transmit, or otherwise distribute any information or content (collectively, “Content”) in violation of any third-party’s copyrights, trademarks, or other intellectual property or proprietary rights. You agree to abide by laws regarding copyright ownership and use of intellectual property, and you shall be solely responsible for any violations of any relevant laws and for any infringements of third-party rights caused by any Content you provide or transmit, or that is provided or transmitted using your User ID. The burden of proving that any Content does not violate any laws or third-party rights rests solely with you. 16. COPYRIGHT. 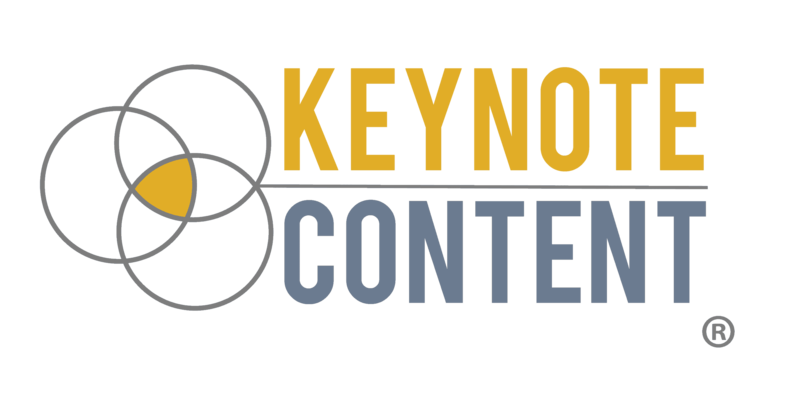 All contents of Site or Service are: Copyright © 2014 Keynote Content and 2018 Keynote Content, 111 Stockwell Street, Castle Rock, CO 80104. All rights reserved. 19. UNITED STATES USE ONLY. The Site is controlled and operated by Company from its offices in the State of Colorado. The domain of the website is registered in the United States and the Site is hosted in the United States. The intended audience for this site consists of individuals in the United States only. Company makes no representation that any of the materials or the services to which you have been given access are available or appropriate for use in other locations. Your use of or access to the Site should not be construed as Company’s purposefully availing itself of the benefits or privilege of doing business in any state or jurisdiction other than Colorado and the United States.